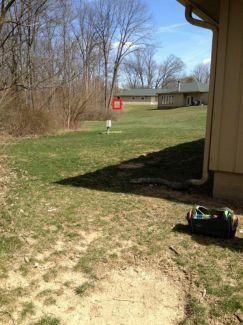 Description: A semi-private 18 hole course on the campus of Horizon Christian School and camp grounds. The baskets are strewn around the property and there are no tee pads, leaving the course layout up to the individual players. Depending on the course layout, there are some nice open shots accompanied by moderately wooded holes and hilly terrain. The course welcomes anyone whenever no one is using it for school or summer camp! Summer: open weekdays after 6:00pm and on weekends. School year: open weekdays after 4:00pm and on weekends. Local Directions: From 79th Street and Fall Creek: head east on 79th street to the top of the hill. Turn Right on Indian Creek Road for a short distance until you see Horizon Christian Church on the right. Take the third entrance on the right and follow the access road past the tennis courts to the parking lot. Basket for hole 1 across from basketball courts.